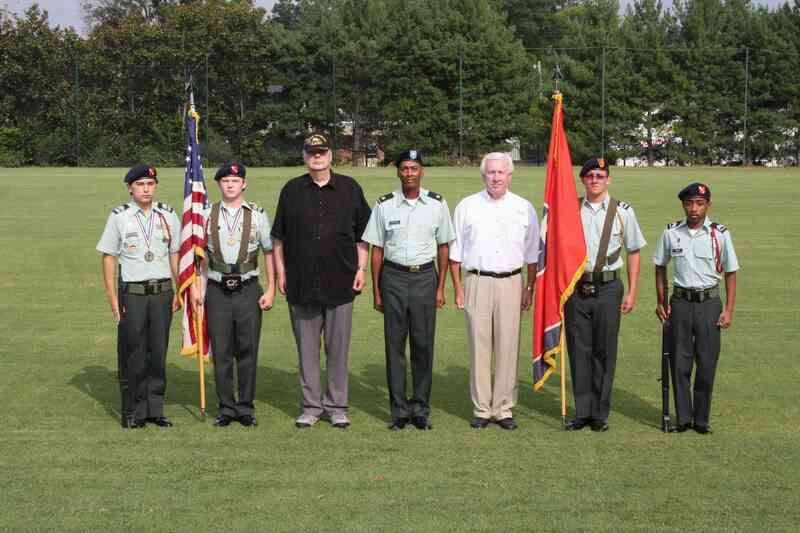 Bob Johnson and Bryant Millsaps, Cadet Commanders of Central’s JROTC Unit in 1964-1965, pose with Lieutenant Colonel Brooks, Senior Military Instructor, and members of the Central Color Guard August 4, 2012. In anticipation of World War I, Central’s Principal Ziegler and faculty requested a military training program in 1916. The program was approved by the Hamilton County School Board, preceding JROTC at Central. 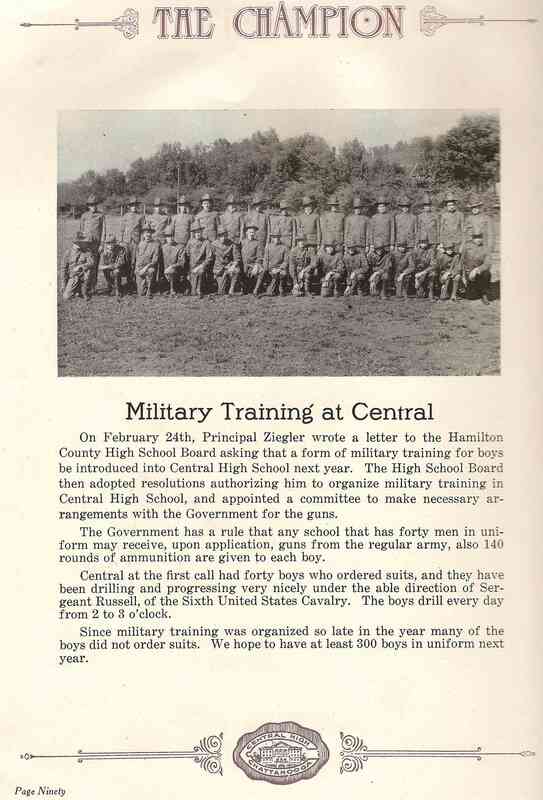 On December 29, 1919, the first Junior Reserve Officer Training Corps (JROTC) unit in Tennessee activated at Central. The Principal’s vision, preparedness for junior military training, and the fine reputation Central held in the State undoubtably were factors in Central’s choice as one of the first 30 pilot JROTC units created by Congress and the War Department in 1916 for the United States. In 1927, the United States Army instituted Honor Unit (later renamed Honor Unit with Distinction) awards. The Central Unit has been an Honor Unit with Distinction since 1927. Further, it has been continuously in operation since 1919, making it the longest continuously operating unit in the South. An average of 185 cadets graduate annually, approximately 16,000 since 1919. Many have gone on to serve as commissioned and noncommissioned officers in one of our Country’s military services. If you are one of them, please share that with us by clicking on comment and telling us about your military service. If you know of Centralites who died in combat, please help us identify and honor them.